In my last post about sundews, I referenced a book about carnivorous plants called, The Savage Garden, by Peter D’Amato. Earlier this month, a revised edition of The Savage Garden was released by Ten Speed Press. Recently, D’Amato appeared on Real Dirt, a garden podcast hosted by Ken Druse, to tell his story, promote the revised edition of his book, and talk about carnivorous plant cultivation. It’s a fascinating discussion, and I highly recommend checking it out. Also, check out the website for Peter D’Amato’s carnivorous plant nursery, California Carnivores. Earlier this year, I wrote about northern pitcher plants and how they are helping us to better understand food webs. At that time I promised future posts about carnivorous plants, so I have decided to write about sundews, the only carnivorous plant that I currently have in my collection. Sundews are members of the genus Drosera and are in the family Droseraceae (the same family as the Venus flytrap). With as many as 194 species, Drosera is one of the largest and most diverse genera of carnivorous plants. Sundews can be found in a wide variety of climates and on nearly every continent, from subarctic Alaska to tropical Brazil. 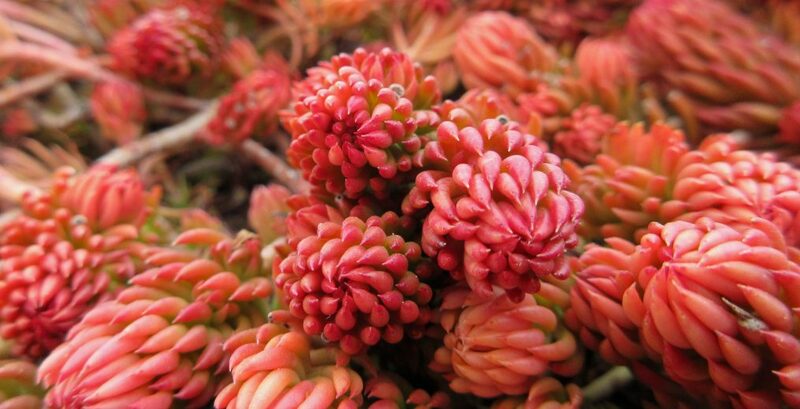 They can be as small as a penny or as big as a small shrub. Their leaves form rosettes and come in numerous shapes and sizes, including circular, wedge-shaped, oval, forked, fern-like, and grass-like. Drosera flowers are also quite diverse, but typically they are flat, five-petaled, white or pink, and appear in clusters at the top of a tall stalk. As described so far, you may be thinking that sundews sound quite simple and innocent, but this is certainly not the case. Covering the surfaces of Drosera leaves are dozens of hair-like filaments. At the end of each filament (or tentacle) is a gland, which produces a small drop of clear and very sticky dew. Attracted to the glistening dew and mistaking it for plant nectar, insects fly into it and find themselves instantly stuck. Struggling to get away, an insect may tear off body parts as it flails about, only to fall into other nearby dew droplets, worsening its ensnarement and ensuring its fate. As the sticky dew attracts and then traps the insects, and the tentacles that support the dew help to further ensnare them, imminent death comes in a variety of ways. The most common for small insects is suffocation, as the glue almost immediately covers up the breathing holes on their abdomens. Larger insects that manage to avoid bodily contact with the glue will instead dangle from the plant and die of starvation or exhaustion. Those that break free, losing an appendage or appendages in the process, usually don’t last long after that and are often trapped and killed by spiders who build their webs around sundews in order to take advantage of such occasions. 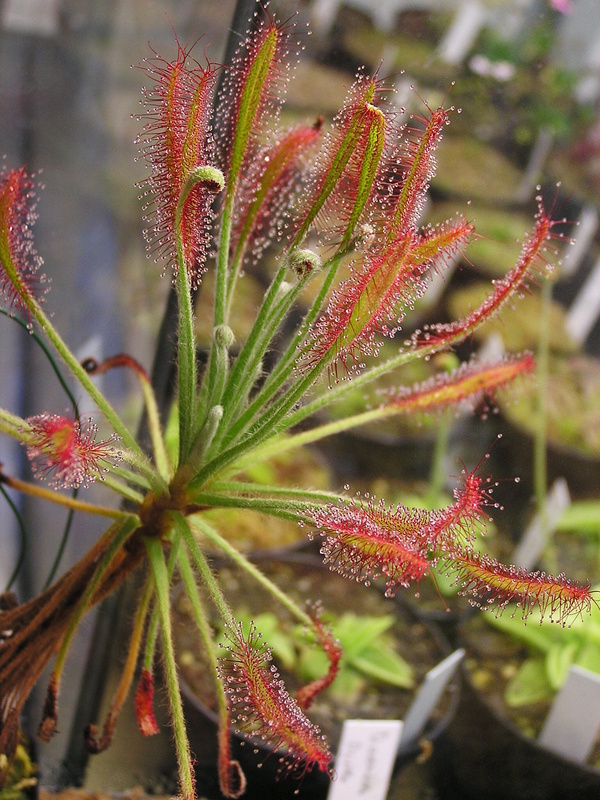 The leaves of some sundews curl up around their prey, not necessarily to further ensnare them, but to surround them with the largest possible number of glands which will help quicken the consumption and digestion process. By now you can see that as innocent and delicate as they may appear, sundews are in fact about as brutal and unforgiving as they come. If you’d like to learn more about sundews and other carnivorous plants, including information on how to grow them, I highly recommend D’Amato’s book (The Savage Garden). It’s a fascinating and informative read, and the reality of the natural world described therein will astound you. It’s garlic harvesting season in the northern hemisphere, so recently while helping out with the harvest at a local farm, I had the chance to learn about a challenge involving growing garlic in southern Idaho. The challenge stems from a disease called white rot. It’s caused by a fungus (Sclerotium cepivorum), and it affects all alliums, including garlic, onions, chives, and ornamental alliums. This disease causes the leaves of alliums to die back, their bulbs to decay, and their roots to rot, ultimately turning the plants to mush. Sclerotia, the dormant stage of the fungus, are small (about the size of a poppy seed), black, spherical structures that can survive in soil for more than 20 years. They remain dormant until the exudates of allium plants awaken them, at which point they begin to grow, unleashing their destruction. Sclerotia can be moved around by farm equipment, flood and irrigation water, wind, and by attaching themselves to plant material. Once this fungus has established itself in a field, it is extremely difficult to eradicate, making the field virtually unfit for allium crops. The threat of white rot and the monetary damage that it can cause led to the establishment of a quarantine zone in southern Idaho in order to protect its $55 million dollar a year onion industry. Due to the quarantine zone, all garlic that is grown for seed within the zone must be inspected and certified, and any garlic seed (i.e. garlic cloves) that are brought into the zone must go through a rigorous testing process in order to be certain it is free of the white rot pathogen before it can be planted. Garlic is a specific threat, because while onions in the zone are typically grown from seed and so are largely free from harboring sclerotia, garlic is grown from cloves, which can readily carry sclerotia. This process significantly limits the amount and the variety of garlic that can be grown in the quarantine zone. 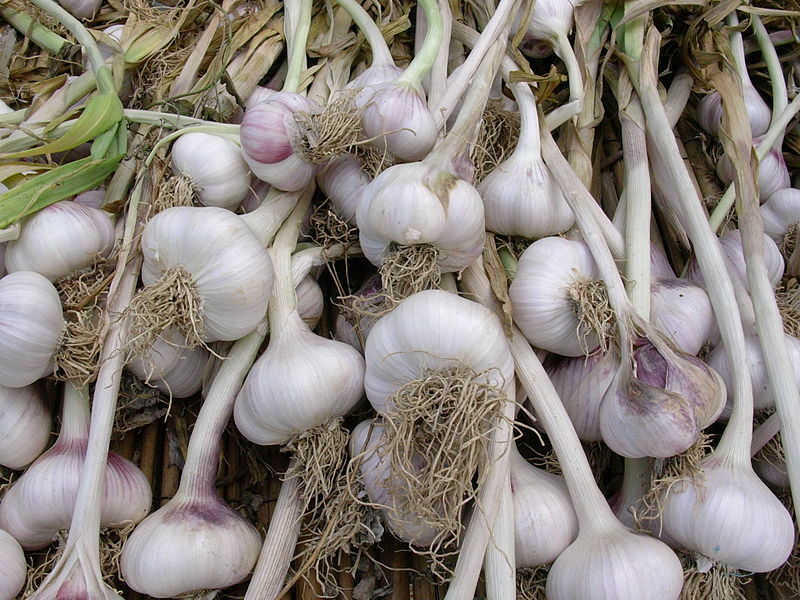 While the quarantine is essential for warding off the threat of this particular pathogen, it stifles the garlic growing industry and makes it difficult for new garlic growers to establish themselves. Growing garlic is already an incredibly challenging pursuit due to the amount of time and physical labor that goes into planting, harvesting, drying, grading, etc. The quarantine, while understandable, is yet another added challenge. Learn more about this issue by reading this article found at Northwest Food News. Humans commonly anthropomorphize non-humans. It just seems easier, for example, to say that a plant “likes” a particular type of soil, even though we know that a plant doesn’t “like” anything because a plant does not experience emotion. What we really mean to say is that a plant is adapted to and therefore performs best in a particular type of soil. However, knowing this, is it plausible at all to say that a plant can see, smell, feel, hear, sense its location, or remember things? Daniel Chamovitz argues that it is, and he has plenty of credible research to support his thesis. In short, plants have senses very similar to human senses and are far more aware than we might initially think. To be clear though, Chamovitz states early on in his book that his “use of the word ‘know’ is unorthodox. Plants don’t have a central nervous system; a plant doesn’t have a brain that coordinates information for its entire body.” Nor do they have noses or ears or eyes. Instead, when Chamovitz uses words like “see,” “smell,” “hear,” and “know,” he is referring to various chemical reactions and physiological phenomena that occur in plants which produce reactions that are analogous to human senses. When a willow tree is damaged by tent caterpillars, a neighboring willow tree becomes unpalatable to the caterpillars and thereby resists a similar fate. Why? Because the damaged willow tree releases a gaseous substance that nearby willow trees can sense (or “smell”). This is a signal for them to protect themselves by building up toxic chemicals in their leaves. Another example offered by Chamovitz involves the ability of some plants to remember winter. Cherry blossoms appear in the spring because winter has passed. A certain period of cold temperatures is what induces this response. If the trees bloom too early, the blossoms will freeze. If they bloom too late, the fruits would not have time to mature before cold temperatures returned. The seeds of winter wheat are planted in the fall and germinate in the spring. They also require a period of cold temperatures in order to germinate. This process is called vernalization, and it involves a specific gene in the plant called flowering locus C (FLC). After vernalization, this gene is turned off which signals the plant to flower (provided that other environmental conditions, such as light and soil temperature, are conducive to flowering, etc.). A common myth is that plants grow better when people say nice things to them or play relaxing music for them. Chamovitz thoroughly debunks this myth and concludes that no evidence has been found for plants being able to hear. Plants do however possess many of the same genes that humans possess, including several genes that when not functioning properly can result in deafness in humans. These genes encode proteins called myosins. Myosins in humans help form the hair cells in our inner ears which are essential for hearing. Myosins in plants help form root hairs which are essential for absorbing water from the soil. While the functions of these proteins are quite different in humans and plants, mutations in the genes code for these proteins can have drastic results for both. All this talk about chemistry, genetics, and physiology may sound a bit intimidating…but don’t worry. While Chamovitz endeavours to tell the science accurately and in detail, he does so in a very approachable manner, making this an easy read for anyone with a basic understanding of biology. Even if you don’t fully comprehend the technical stuff, the anecdotes are well told and captivating, and after you finish reading this, you are certain to have a greater appreciation for plants and all of the fascinating things that they can do. While we should be careful to be too anthropocentric, this book makes it clear that plants are a lot like us…or should I say, we are a lot like plants? Either way, we have many things in common (including much of our DNA), which is all the more reason to appreciate plants for the amazing organisms that they are. This is a video (recommended by Chamovitz) of a dodder plant sensing the location of a tomato plant. Dodder is unable to photosynthesize, so after attaching itself to the tomato plant it will feed on the nutrients that the tomato plant produces.